Of all the high-tech bits on a bike, the final drive chain is probably the most anachronistic. Hundreds of tiny plates, pins, bushes and rollers, all spinning round at high speed? Exposed to the rain, dust, grit and debris off the road? With nothing but a squirt of chain lube now and again to protect it? It’s amazing the things last more than ten minutes. But over the years, they’ve proved to be the best solution for a performance final drive, kicking belts and shafts into touch with their light weight, low inertia, and surprisingly high efficiency – when properly maintained. But they can always be optimised. Especially on a track bike, or race bike, where the miles are low, maintenance is higher, and the conditions are more controlled. Many riders and race teams choose to replace the standard chain on a bike with a narrower, lighter chain, maybe without sealing ‘O’ rings. A chain like this wouldn’t last fifty miles on a winter touring ride with a pillion and a load of luggage, but it will save weight and cut friction losses on the racetrack. Enter the T3 Racing 428 sprocket conversion. 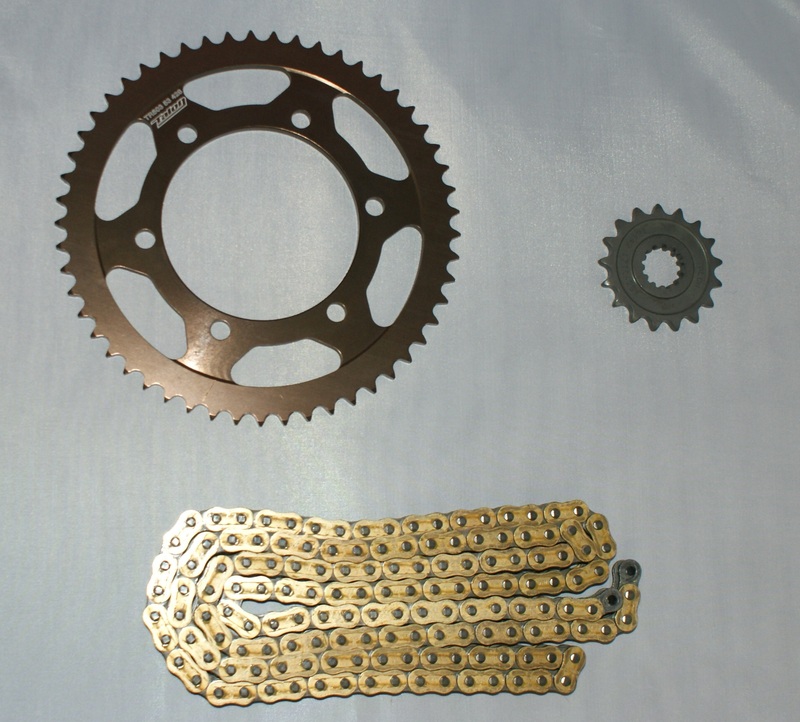 Rather than just swapping a 530 or 525 chain for a 520, this kit moves right down to a 428 chain. (A quick explanation of chain sizes – the first digit is the space between the pins, in eighths of an inch, the second digit is the width of the rollers in eighths of an inch. So a 520 chain has 5/8ths of an inch between the pins, and the rollers are 2/8ths (or 1/4) of an inch wide. Easy?) So a 428 chain has 4/8ths (or 1/2) of an inch between the pins, and the rollers are 2.5/8ths of an inch wide (or 5/16ths wide) despite being called a 28… So it’s a smaller chain, with narrower pin pitch. That means 30 per cent less weight, reduced friction (giving 2bhp more peak power), and also thinner, lighter sprockets. All good. 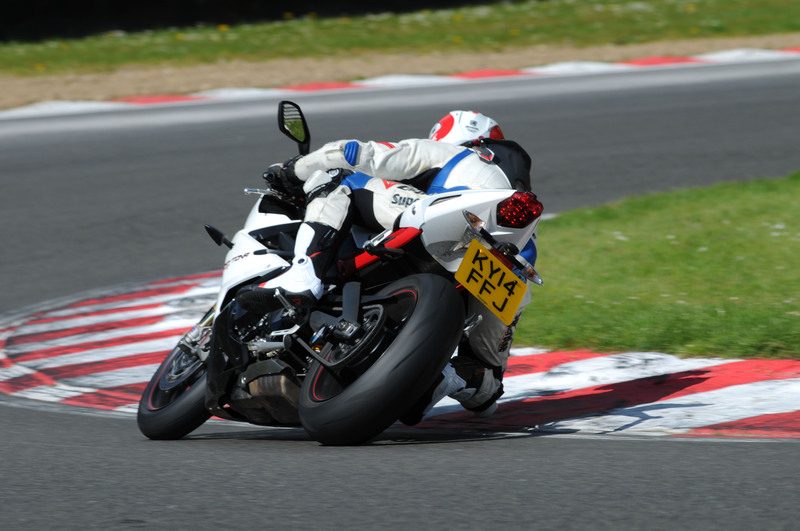 Triumph;s 675R doing what it does best – smashing apexes and grinding knee sliders. But there’s another advantage, which is why the 428 kit has become popular in racing. The smaller pin pitch means that gearing changes can be chosen to make much less difference to the wheelbase. As an example, changing more than one tooth on the rear sprocket of a 520 chain drive will alter the wheelbase by 9mm. That’s a big change on finely-set-up supersport race bikes. A 525/520 set up, running 15/47 sprockets would rev out at 162mph in top gear. If the rider had a problem with gear selection/ revving out at one point of the circuit, the only option would be to either go to 15/46 or 14/45, these would then rev out at 166 or 158mph respectively and also give a similar 4mph adjustment in shifting right up through the gears. As you know, this usually ends up with a compromise at most circuits, especially when running a stock gearbox. However- with a 428 set up running similar gearing, you would have a choice of 17/54 (160mph), 18/57 (161mph), 17/53 (163mph), 18/56 (164mph). The finer adjustment right through the gears means you can almost eliminate the need for compromise and find the ‘perfect’ gearing for the rider and circuit without affecting wheel base to a high degree.